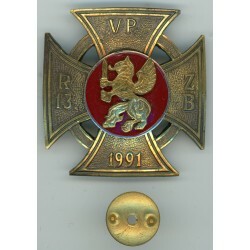 Awards of National Guard of the Republic of Latvia There are 29 products. 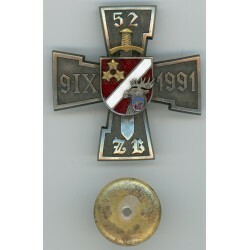 Badge of the 35th Home Guard battalion. Excellent condition. The enamel is essentially perfect. 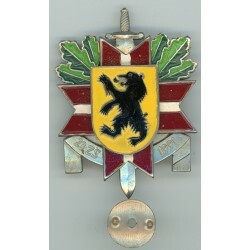 Badge of the 14th Home Guard battalion. Material - Dimension - Without Markers mark. 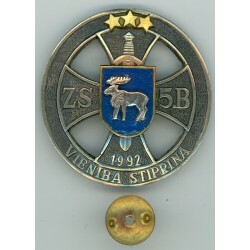 Latvian railway enamel badge very good condition. 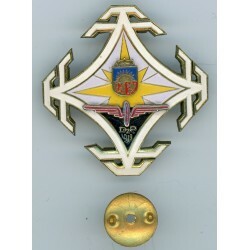 Brass, enamel, without master marks; multi piece construction. Measures aprox. 48 x 48mm. 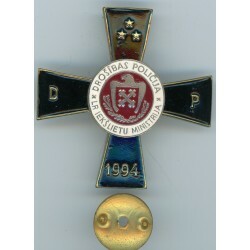 Badge of the Latvian Interior Ministry security police in very fine condition. 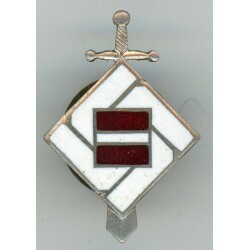 The badge without master marks ;enameld (black,white and red); multi piece construction. Measures aprox. 45 x 45 mm. 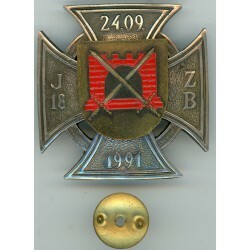 Badge of the 18th Jurmala Home Guard battalion in a good condition. 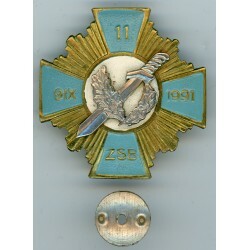 The badge without master marks ; multi piece construction. Measures aprox. 47 x 47 mm. 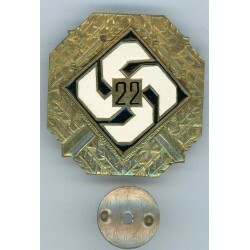 Badge of the 23th Home Guard battalion in a good contition. 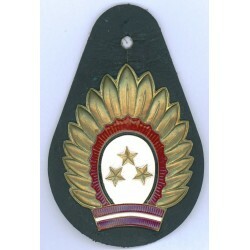 The badge without master marks; multi piece construction,enamel. Measures aprox. 43 x 43 mm. 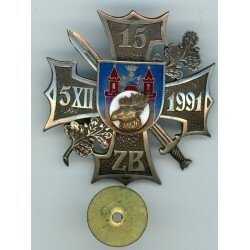 Badge of the 13th Riga Home Guard battalion in a good condition. 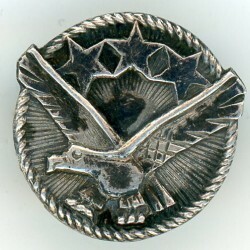 The badge without master marks; multi piece construction. Measures aprox. 47 x 47 mm. 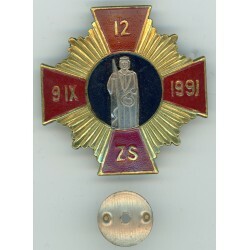 Badge of the 12th Riga Home Guard battalion in a good condition. 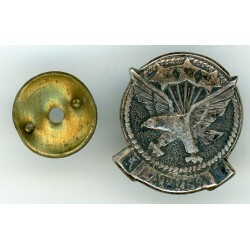 The badge without master marks; multi piece construction. Measures aprox. 46 x 46 mm. 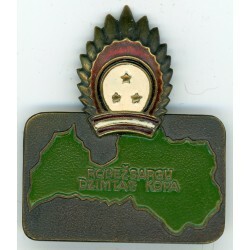 Badge of the 11th Riga Home Guard battalion in a good condition. 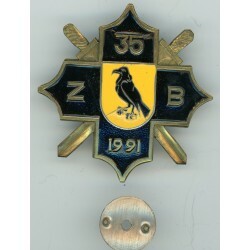 The badge without master marks; multi piece construction. Measures aprox. 47 x 47 mm. 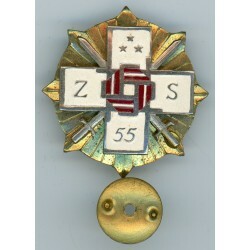 The badge of the national association of Latvian soldiers in a good condition with enamel. Circa 90ies of 20th centure.Consistent with its age, Please see scans! 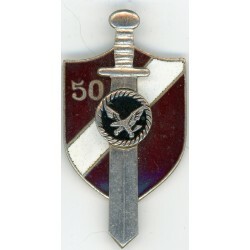 Title- 50 and association symbol. Dimensions –apprx. 47 x 25 mm. Material - alpaca. The pictures are from actual item that you will recieve. 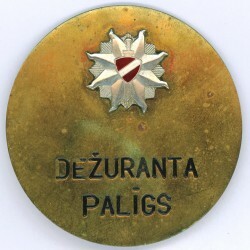 The badge of the national association of Latvian soldiers in a good condition. Circa 90ies of 20th centure.Consistent with its age, Please see scans! 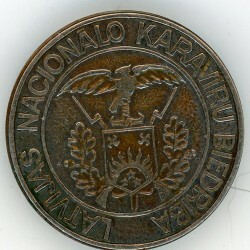 Title- Latvijas Nacionālo Karavīru biedrība and association symbol. Dimensions – round, diameter apprx. 26 mm. Material - alpaca. The pictures are from actual item that you will recieve. 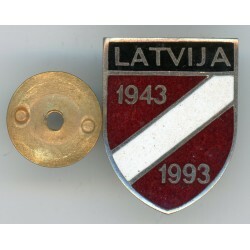 The badge (mini) of the national association of Latvian soldiers in a good condition. Circa 90ies of 20th centure.Consistent with its age, Please see scans! Title- without title; only association symbol. Multi piece construction. Dimensions – round, diameter apprx. 15 mm. Material - alpaca. The pictures are from actual item that you will recieve. 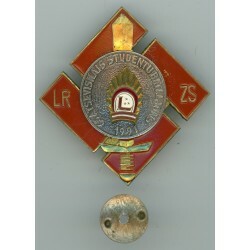 The memoril badge of the Latvian Legionnaires in a good condition with enamel. Circa 90ies of 20th centure.Consistent with its age, Please see scans! Title- Latviaj,1943-1993. Multi piece construction. Dimensions – apprx. 27 x 21 mm. Material - alpaca. The pictures are from actual item that you will recieve. 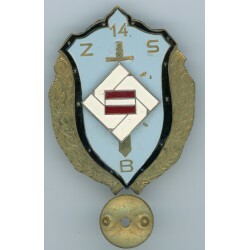 The Badge of the 14th Home Guard battalion(mini) in a good condition with enamel. Circa 90ies of 20th centure.Consistent with its age, Please see scans! 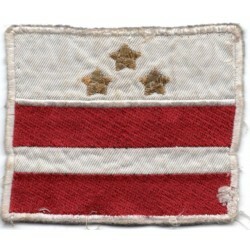 Title- without title, with 14th Home Guard battalion symbol. Multi piece construction. Dimensions – apprx. 29 x 20 mm. Material - alpaca. The pictures are from actual item that you will recieve. Latvian national guard headquarters station master`s on duty badge in a good condition. Circa 90ies of 20th centure.Consistent with its age, Please see scans! Title- national symbols. Dimensions – apprx. 91 x 61 mm. Material - brass and leather pad for a badge. The pictures are from actual item that you will recieve. 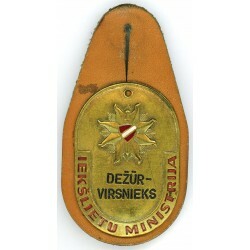 The duty officer`s badge of the Latvian Ministry of the Interior in a good condition. Circa 90ies of 20th centure.Consistent with its age, Please see scans! Title- Latvian Ministry of the Interior`s symbols. Dimensions – apprx. 76 x 41 mm. Material - brass and leather pad for a badge. The pictures are from actual item that you will recieve. 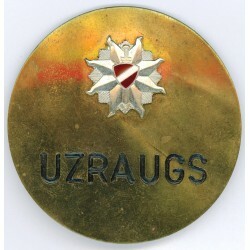 The badge of the Latvian Ministry of the Interior - Correctional officer (Uzraugs) in a good condition. Circa 90ies of 20th centure.Consistent with its age, Please see scans! Title- Latvian Ministry of the Interior`s symbols. Dimensions – round, diameter apprx. 57 mm. Material - brass. The pictures are from actual item that you will recieve. 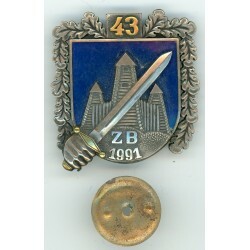 Latvian Rifle Regiment memorial badge LSP 75 in a good condition. Circa 90ies of 20th centure.Consistent with its age, Please see scans! 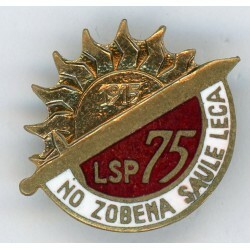 Tittle- 1915, LSP 75"No zobena saule lēca" ( the sun springs out of the sword) Dimensions – diameter apprx. 24 mm. Material – brass, enamel. The pictures are from actual item that you will recieve. Latvian military cloth insignia - made from cotton in a good condition. Dimensions - approx.77 mm x 63 mm White cotton, rectangle shaped cloth insignia, that ought to be attached to sleeve, machine embroidered three golden stars that represent regions of Latvia, and red and white colors that represent Latvian flag.